Roof Repair for Businesses and Industries in Southlake and Grapevine is now more Energy Efficient and Cost Efficient than ever. Flat Roofs have a tendency to require more maintenance and repair work, and in the long run sill costing the company with high electric bills. At Southlake Roof Repair, we will put an end to High Energy Bills with our Energy Efficient Flat Roof Repair methods. An Innovative method of Commercial Roofing is what we offer to Business Owners. Single Ply Roof Systems are a Higher Quality of Product and offer Solar Reflective Properties. With Solar Reflective Properties installed on your Commercial Property, you will witness Cooler roofs, cooler buildings, and lower energy costs. 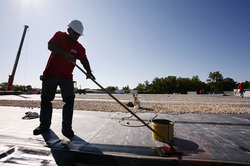 Southlake Roof Repair is certified in Commercial Roofing. We only employ Roofing Contractors that are Skilled and have multiple years of experience under their belt. Our Team of Certified Commercial Roofing Contractors will evaluate your Company Roof and begin work as ﻿soon﻿ as you are ready. Need to work around a specific schedule because of customers? Not a problem. We will work around your schedule, not effecting or discomforting your patrons in anyway. Call us today to set up a Free No Obligation Estimate for Roofing Work. Our Offices are open during the week at (972) 447-6337. You can also reach us using the simple form on the right. By submitting it, our team will receive your information and you will be contacted soon.